Hello all! I hope you have all had supercalifragilisticexpialidocious weeks! Quick reminder: I will be in Boise June 13th for a book signing at Hyde Park Books! So one of the top trends on Twitter (which you can find me at @AllisonHawn) this past week was #50FactsAboutMe. I saw this particular hashtag as a challenge and I conquered it by posting 50 facts about myself on Twitter. Granted, most people wrote things like, "I don't like chocolate," or, "I think puppies are cute," which were all fine and dandy (except how can you not like chocolate!?). My facts were a little, shall we say, less orthodox? After a some requests from those who caught snippets of my facts throughout the day, I am posting the entire list here (with a few expanded explanations beyond my 140 character limit). So here they are in all their... glory? 1. I've never understood why there could only be one Highlander, didn't their mothers teach them to share? 2. 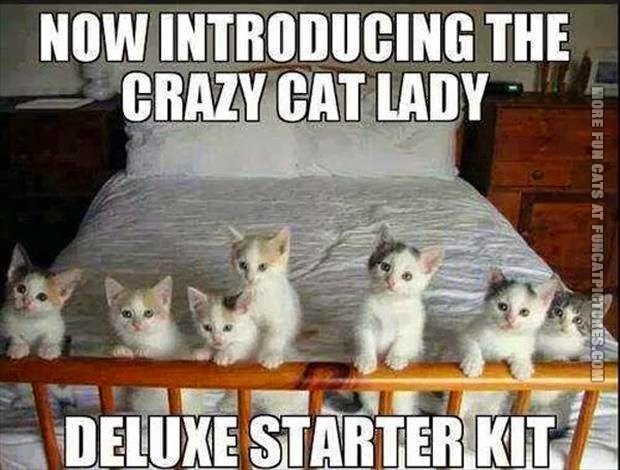 I am only a couple of cats and one sweatervest away from becoming a crazy cat lady. 3. I am missing one of my vital organs, and am still alive. This makes me either a medical miracle or a zombie, you pick. 4. When I don't sleep, everything starts to taste like Cheetos. So Cheetos taste like "lack of sleep" to me. 5. I am incapable of digesting anything with hooves (see fact #3). Sorry chickens and fish, you're still fair game. 6. I have never thought pugs were cute. (It's that breathing sound they make. Nightmares). 7. I do not believe that Wheaties are the breakfast of champions. 8. I could eat sushi and Pad Thai every day for rest of my life, which would be short due to nutritional deficits from eating only sushi and Pad Thai. 9. 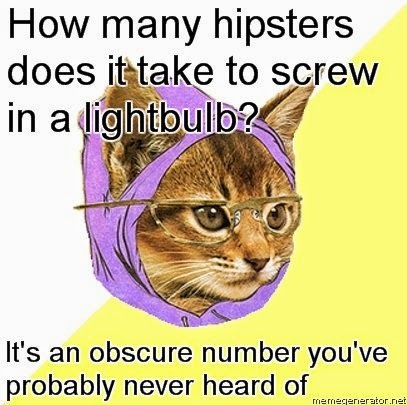 I like to talk to hipsters about bands I made up to see if they will claim to have heard them. 10. I have eaten chicken's feet. They taste like rubber bands. 11. I once started a mosh pit a Christian rock concert out of sheer boredom. 12. I have often wondered if I replace all the blood in my body with caffeine if I could become immortal. 14. I can't juggle. I am really good at throwing things on the floor, though. 15. 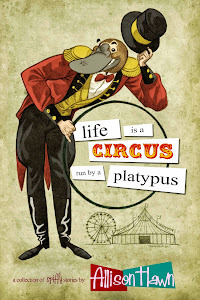 I titled my first published book "Life is a Circus Run by a Platypus" on mistake. 16. I've always wanted to learn how to be a fire eater. 17. I believe that kale, in all of its forms, is disgusting. 18. I attribute my strong immune system to my childhood penchant for attempting to eat pennies. 19. I have a slight addiction to pomegranate juice. I may have once tackled someone for some. 20. 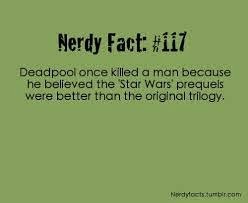 I judge people who believe that the "Star Wars" prequels were better than the original trilogy. 21. I've always wanted Batman's utility belt. Do you know how useful that would be? 22. At 25 years old, I still get carded to see rated R movies. 23. I once ate a full baby octopus. Slimiest food ever. 24. I hate polka with a fiery burning passion. 25. I just sang, "We're halfway there, oooOooooh livin' on a prayer!" 26. I am writing these facts to procrastinate cleaning my bathroom. 27. I have worn a kilt to work on multiple occasions. 28. I'm not a huge fan of sugar, but I will kill for red velvet cake. 29. I have all the lyrics to Smash Mouth's "All Star" completely memorized. 30. I can sunburn in less than ten minutes. 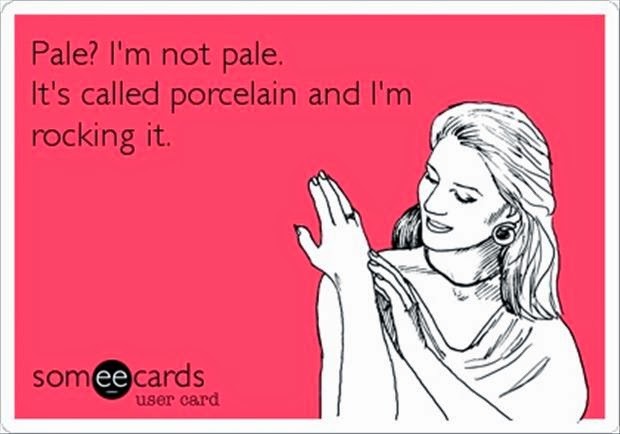 I'm so pale I'm practically translucent. 31. When I run I look less like a graceful gazelle and more like a drunk baby deer. 32. I've never understood why the popularity of the phrase YOLO (for those of you not exposed to obnoxious people "You Only Live Once") didn't make people more paranoid and cautious. 33. I honestly want to know how much wood a woodchuck could chuck. I need numbers people! 34. I get much of my news from The Daily Show because it's the only way I can watch current events without hating humanity. 35. I never liked the T.V. show Lost. There were so many plot holes and lame dialogue moments. 36. I don't own a television. In fact, I have never owned my own television. 37. I still own a dumb phone. That's right, I am a technological dinosaur. 38. 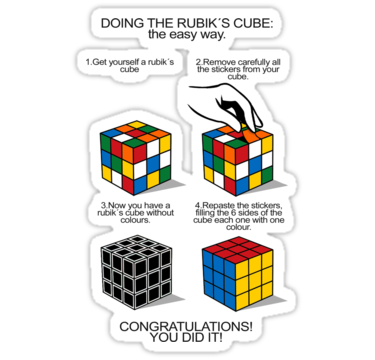 I solve Rubik's Cubes... with a screwdriver. 39. Some people have a favorite singer, artist or celebrity. I have a favorite philosopher. 40. I am extremely suspicious of cattle. 41. I hate the play Hamlet, but still manage to love "The Lion King." 42. I have multiple music playlists that feature both heavy metal and Disney music on them. 43. As a kid, I wanted to be a velociraptor when I grew up. 44. My coworkers have gotten used to me bringing coloring books and colored pencils to meetings. 45. I procrastinate doing useful things by doing other less hated useful things. 46. I am a herbicidal maniac, I kill plants. 47. My foot fell asleep, I'm jealous. 48. I am not a giant fan of holding babies. There is just so much noise/goo/smell that can happen. 49. I've read "The Hobbit" nine times now... because I am that much of a nerd. 50. I have a scar from making Scottish shortbread. Want to know more? You can always find me on Facebook, Twitter (@AllisonHawn), and Goodreads!